First location picture (taken this week) from the set of Lenny Abrahamson’s Frank (2013), based on the memoir by Jon Ronson. From left: Maggie Gyllenhall, Michael Fasssbender (who plays Frank) and Domhnall Gleeson. 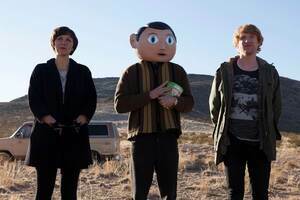 Frank is “a fictional story loosely inspired by Frank Sidebottom”, the persona of cult musician Chris Sievey who died in 2010. Surely There’s A Script In This? What Lenny Said Staying In Tonight? 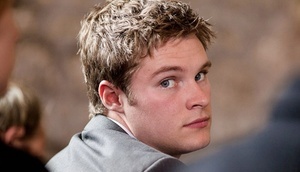 Posted in Misc and tagged Lenny Abrahamson at 11:18 am on January 10, 2013 by DelBoy.